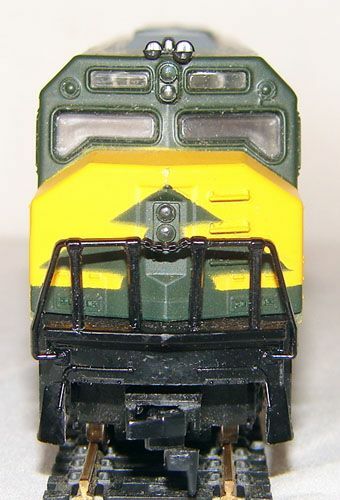 There are at least two variations to this Union Pacific AHM FP45 release. The original version features small red Union Pacific lettering down the side of the engine. Later editions include larger lettering, the road's shield herald, and mid-1970s "We Can Handle It" slogan. 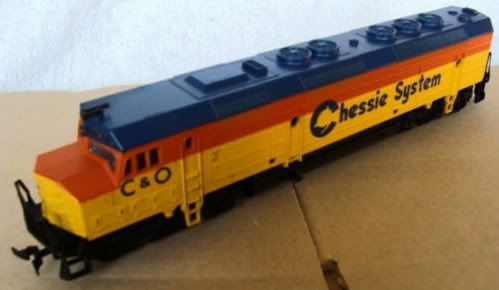 Listed as a new in AHM catalogs of the early-mid 1970s, this HO-scale EMD FP45 model stayed in the company's roster through the early 1980s after arriving on the scene in mid-1977. 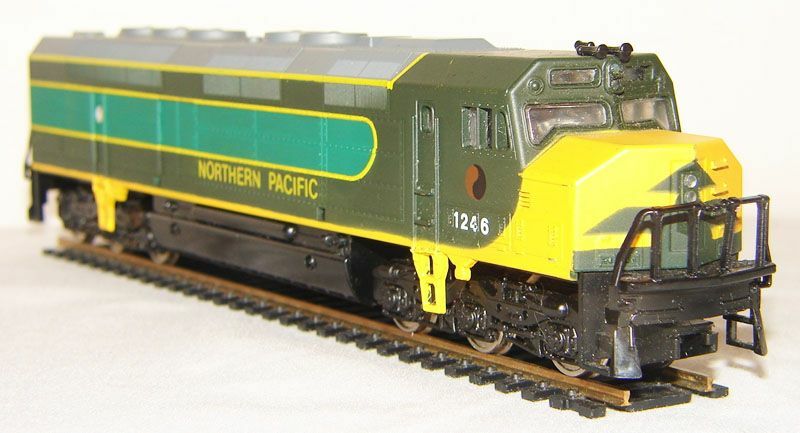 The FP45 models found on this page differ from those found on the neighboring page under the FP45C -Lima heading. The Lima-made FP45 models were the first sold by AHM and did not remain in the catalog long. By the mid 1970s, AHM switched from importing its Lima-Italian-made FP45 to a Mehano Yugoslavian-made FP45 release presented here. This second FP-45 model is distringuished from the Lima FP-45 by the open front and rear pilots, which are attached to the shell and not the trucks in this example. This FP-45 also has steps included on the shell, not cast on the trucks, coming down from the cab. At its introduction in the middle of 1977, the retail price for this model was $17.98. Non-powered examples originally sold for $7.98. Non-powered examples are noted in AHM's stock numbering with a "D" added to the end of the number. The 1980 AHM Catalog lists this model with a $24.98 suggested retail price. Prior to joining the AHM line, this FP45 was found Life-Like catalogs in the early 1970s. Life-Like's diesel roster in its early days included a number of Yugoslavian-made models, including Alco Century 628 and 415 offerings, plus this EMD FP45 model. 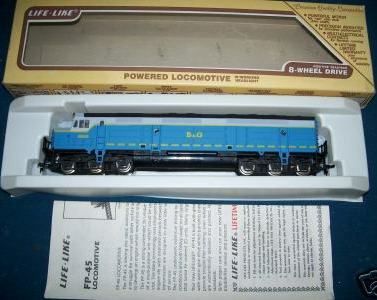 You may click on the image of the Life-Like B&O FP45 above for further information. Since this version of the FP45 disappeared from AHM's line and the company itself vanished from the market in the 1980s. This European-made FP45 survived. 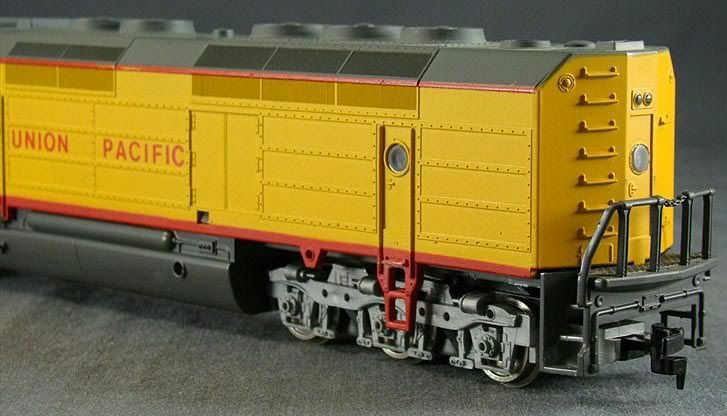 IHC (International Hobby Corp.) is the most recent company to import a run of the Mehano-produced FP45 model. If you click on the Santa Fe FP45 below, you'll go to Mehano's site that details this loco. Mehano has made improvements to this model, since its early 1970s debut. Current Mehano FP45 diesels include all-wheel drive with a revised chassis and trucks. The model also appears to have lost the pair of holes along the body side that allowed the underframe to snap into the shell on early versions.